To foster, expand and perpetuate the practice of archery in the United States and a spirit of good fellowship among archers. To encourage the use of the bow in the hunting of all legal game birds and animals and to protect, improve and increase the privileges of bow hunters. To cooperate with the Federal and State governments, and sportsman and conservation organizations in the propagation and conservation of game and its natural habitat, the forest and fields. To conduct a continuous educational program designed to acquaint the public with the bow and its safe use. To acquire real property by purchase or lease for use in the promotion and practice of archery. To protect and improve and increase the privileges of bow hunters. Perpetuate the use of the bow in accordance with its ancient and honorable traditions. Our club was established in 1951 by five archers, Jack Doub, John Daughtery, Roy Cotozzi, Ab Linsey, and Bill McCart, and incorporated on February 4, 1954 with approximately 50 archers from the Bedford/Mitchell area. These archers were made up from all walks of life, Doctors, Lawyers, Farmers, Businessmen and Factory Workers who hunted. The groups shooting range was set up on the banks of the White River on the old Murphy/Weitknecht farm, thus the name of the club became “White River Bowhunters”. Since the start of the club their headquarters has switched location numerous times. The club members were determined individuals who held shoots in old Pig Houses, Chicken Houses, Warehouse Attics, Airport Hangers, Commercial Basements and City Dumps, just to keep the club alive. The club grew in popularity and became known throughout the state as one of the most competitive clubs in Indiana. The members were never satisfied with the type of equipment that was purchased off the counter of sporting goods stores. One of these individuals was Ab Linsey, who designed and built the fastest recurve bow of its time, “The Flimsey Linsey”. Linsey’s bows were in demand by shooters all over the country. Jack Daub was another top archer in competitive archery in the late 1950’s. He was chosen as the archer in a film shown to service me, throughout the South Pacific, to promote interest in the sport as a means of relaxation and personal accomplishment. The film was shot in Mitchell Indiana. The club membership has varied from 5 to 150 people, from the age of 6 years to an active bowhunter 82 years of age. The first shoot fees were $0.75 and winners received ribbons. Over the years the winners received bags of potatoes, turkeys (frozen or live), pies, silver dollars, trophies, arrows, etc. The club worked with other clubs in the area to promote the sport of archery. When one of the area clubs had no place to shoot, Our Club, Orleans, Salem, Paoli, Bloomington, Pike County, Greenwood, and other clubs offered their grounds to each other to hold shoots on. Field trips to Rabbit hunt, Squirrel hunt, Carp shoots, and Deer hunts along with Camp Outs, Cook Outs and Indoor Leagues are some of the many things that the members have enjoyed doing together. Over the years the club has helped other clubs outside of archery get established in the area. We teach I.D.N.R & N.B.E.P Hunter Education classes to promote the safe use of archery equipment while hunting. 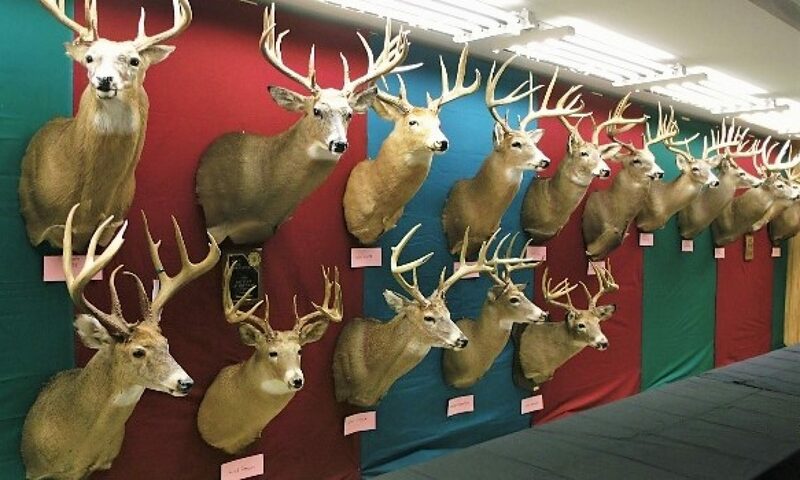 The many “Thank You” plaques on the club house walls from Indiana Dept of Natural Resources, Schools, Scouting Groups, Hospitals, and other Clubs shows our determination to live up to the “Founding Purpose” of the club, which is to promote archery. The club hosted its first “Bowhunters Jamboree” in 1966. This has been an ingoing archery shoot ever since. This event was attended by 180 archers. They shot in laminated cardboard 2D targets and the top 25 shooters were allowed to attend the Crane Navel Ammunition Depot deer hunt. In 1968 the club purchased 47.7 acres, where they are presently located Over the years they acquired more land and now have 121.09 acres on which we have a Club House with Indoor Range, Outside Practice Range, 14 target Field Range, 15-40 target 3D Range, Modern Camping and Primitive Camping areas, Shelter House and a Catch and Release Fishing Pond. The pond was named Gregory Lake in 2017 after long time club member, charter member and Chairman of the Board, Harold Gregory. In 1985 the club became affiliated with the International Bowhunting Organization and hosted the 2nd Jewel of the National Triple Crown. This event has since grown to the largest archery shoot in Indiana, and has been attended by shooters from every state in the United States as well as shooters from Canada, Australia, and Spain. Over the past years the club has produced some of the top male and female shooters in the field of archery. Championship “Bowhunters Nationals” Teams, Individual State Champs, and National Title winners. Times were not always good for the club! During the tough years, the members generously took from their own pockets to keep the club afloat. It is with both pride and gratitude that we recognize all our past and present members as true promoters of archery.